From them, to us, to you..
For over 130 years our family have farmed this part of the South East, and for the last twenty we've been working to produce the very best quality organic eggs. And to get the very best eggs, we believe, the welfare of our chickens has to come first - riddle solved! For us, that means taking a slightly different approach to the vast majority of other British and EU organic and free range farms. For example, all our hen houses are mobile. That means before any new flock arrives we rotate their house to a fresh piece of pasture. It's way more labour intensive, but it ensures the land grows back into a healthy, fresh and natural environment for our birds, so we think the extra effort is worth it. 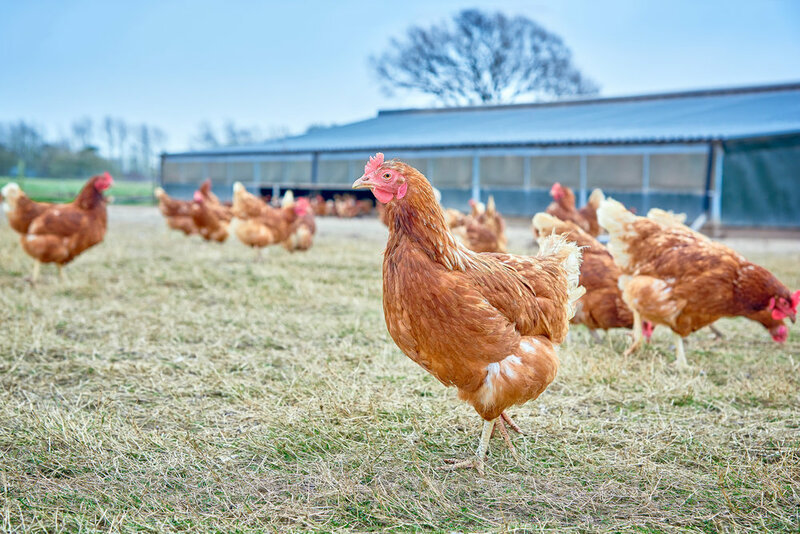 As an organic farm, we don't use any chemicals or artificial fertilisers on our land, and the chickens get a natural, balanced organic diet that meets all of their nutritional needs. Every morning at 5am we visit each shed to check everything is working as it should be, before letting them out at 8am to graze and forage throughout the day. Around sunset they naturally make their way back inside before we go around and manually shut the pop holes to keep them warm and safe from predators. Each hen lays, on average, 5 to 6 eggs a week in specially designed nest boxes which we collect daily by hand. The eggs roll gently down to an egg belt running the length of each nest box, and we wind them to one end of the shed for collecting. At this point, they get their 'first sort'. The eggs are placed on trays, separating out any with noticeable imperfections - irregular shells, dirt or cracks - before they're buggied back to The Shed for grading. Before they get to the Grader, the eggs get a second, careful sort. The best are loaded onto the conveyer where they're transferred to rollers that carry them over the candling lights. Candling reveals any flaws in the shells that aren't easily visible to the naked eye. Any shells with hairline fractures or other imperfections are removed by hand, and the remaining eggs continue on their way. After candling, each egg is stamped with a unique code identifying the farm and its location. They're then graded into different sizes according to their weight: X-Large, Large, Medium and Small. Finally, they're packed by hand into cartons for shops or onto trays for kitchens. This is a final chance to make sure only the best quality eggs leave the farm. Every box is stamped with a best before date, 28 days from when they were laid, and then packed into cases of 15 or 30 dozen ready for delivery. 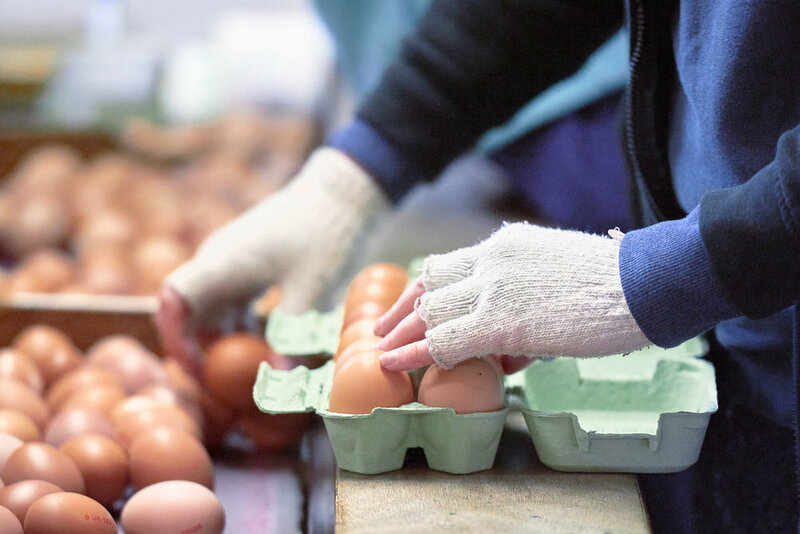 With all the time, care and attention we spend on each stage of the process, it's important to us that we deliver our eggs when they're at their very freshest and best. Typically, that means they're with our customers within 24 hours of us collecting them. So that's a glimpse at what goes in to producing a Rookery Farm Organic Egg. It's takes lot of work and a lot of heart, but we think it's worth it... and we think you will too.